Ducati has a rich history of middleweight sportsbikes that have always sat below its iconic top-level sportsbikes. They've been the accessible performance cornerstone in the premium Italian motorcycle manufacturer's line-up. The Ducati 916 series had the superb 748/9. 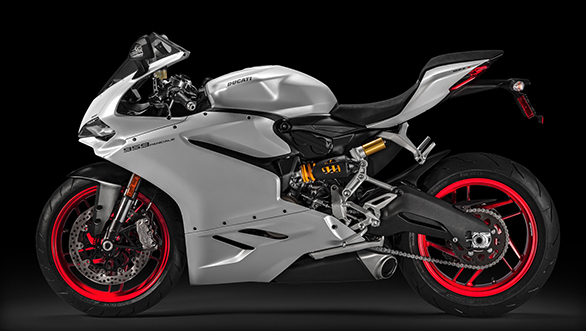 The Panigale had the 899, and it's that motorcycle that's grown up to become the new 2016 Ducati 959 Panigale. 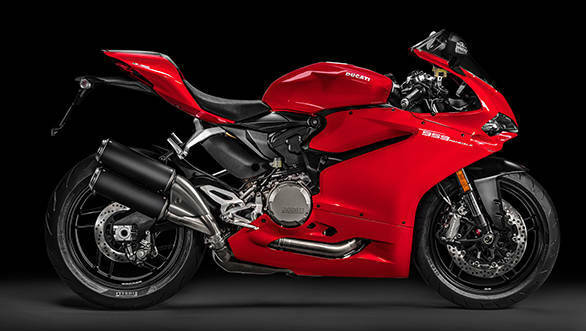 It looks roughly the same, badges aside, as the big Ducati Panigale, but the Euro-4 compliant versions have a side slung twin can shotgun exhaust that identifies the 959. In sum, there are updates all around but big one is a slightly longer stroke that brings 57cc more, more torque across the band and more power. The Ducati middleweight sportsbike is expected to be easy to ride fast on street and on track while offering a lower price point. Indeed, at Rs 14.30 lakh (ex-showroom, Pune), it's terrific value for a sportsbike with so much gear compared to its two nearest competitors - the MV Agusta F3 800 and the Triumph Daytona 675R. Let's take a closer look. This is the easy part. The Ducati Panigale's all look alike and the 959 isn't an exception. The svelte fairing and the minimal head lamp cut a striking, deeply pleasing figure, and it certainly ranks as amongst the most wonderful looking motorcycles in production today. The 2016 models get bigger intakes under the headlights as well as a wider upper fairing for better wind protection. We have already mentioned the exhaust but the 2-1-2 system has two versions. The American (non-Euro 4) bikes get a different belly PAN and neatly integrated exhausts. The more stringent Euro-4 complaint bikes get and uglier system which uses side slung twin exhausts. These allow the space under the engine to be occupied by Euro-4 hardware while taking the sound source away from the centre of the motorcycle where the Euro-4 noise norms are measured. We understand that the bigger exhaust header diameter (versus 899) means you can use exhausts meant for the 1299, though it means new bellypan plastics will have to be added as well. We have had bones to pick with recent Ducati's finish levels, especially on the mechanical-heavy bottom half of motorcycles like the Monster and the Scrambler. The 959's fairing hides almost all of that and therefore finish levels should be unquestionably excellent. The basics first. The 959 uses 90° v-twin that Ducati calls the Superquadro. This engine is tilted 21° back - so that the rear cylinder is 21° leaned back past the vertical. Ducati says this allows a 48:52 weight distribution front to rear. This is ideal because one fuelled and with a rider on board, the bike sits on the perfect 50:50 weight distribution. Obviously this is motorcycle with desmodromic valves. That means the Ducati positively opens as well as closes all its valves avoiding problems like springs floating at high revs. It's an old Ducati tradition and it has served them well. A new system allows the engine to employ a slightly different can profile at startup to keep the exhaust valve open and decompress the cylinders during startup. This allows Ducati to deploy a smaller starter motor which saves as much as 3.3kg, says the manufacturer. 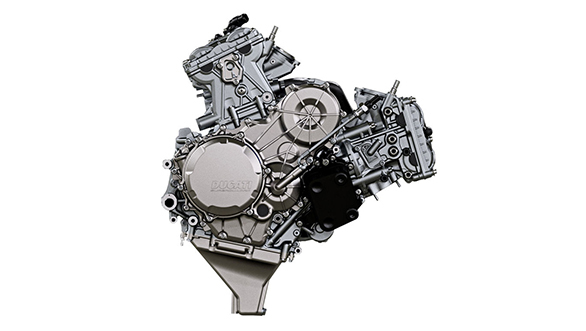 The 959's engine received a longer stroke over the 899 engine that brings the displacement up 57cc to 955cc. This produced 157PS at 10,500rpm and 107.4Nm at 9,000rpm. Ducati claims a six per cent rise (versus 899) in peak power and an eight per cent rise in peak torque with extra torque available all the way across the rev range. Ducati says this makes the new motorcycle much easier to ride in every condition, especially assisted by its riding modes. 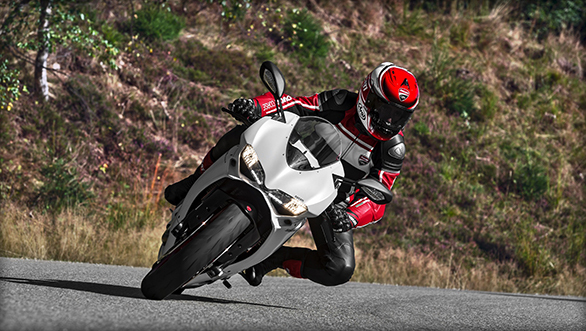 The Ducati 959 Panigale has a six-speed transmission with a quickshifter and a slipper clutch. Against the 899, the 959 is geared a bit taller to use the extra torque better and offers a smoother, more linear brand of power. Obviously the 959 is fully ride by wire. That means the throttle is connected to the ECU which makes the final decision on fuel and spark delivery for best performance based on a number of factors, including throttle opening, load and riding mode. 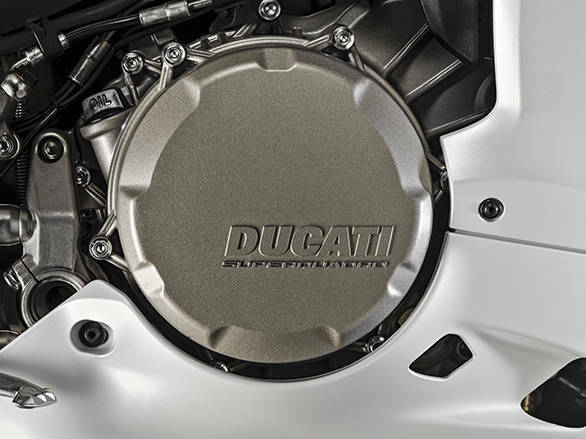 The Ducati engine also uses secondary air injection to clean up any unburnt fuel in the tailpipe. 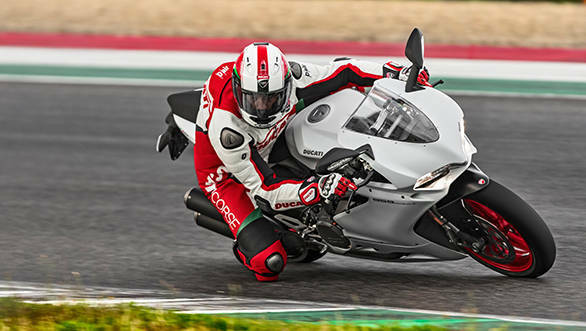 The Ducati 959 Panigale also gets a standard Ducati Quickshifter (DQS). This allows the rider to upshift rapidly without closing the throttle. Quickshifter systems cut the spark momentarily to allow momentary slack in the transmission to push the shift through. Systems are available that offer both up and downshift quickshifters. The 959 system only does upshifts while the 1299 system can handle both upshifts and downshifts. Like all the Panigales, the Ducati 959 also uses a tiny monocoque that uses the engine as a stressed member. The engine is what the rear subframe and suspension bolt to while the monocoque underpins the engine to steering head connection. Ducati have cleverly designed the monocoque to function as an air box and it contains the air filter and the injection mechanism as well. The bottom of the steel tank is used to complete the air box once mounted. The front suspension is fully adjustable Big Piston Forks (BPF) from Showa. The BPF is said to offer damping performance at lower pressures which improves suppleness and feel. The rear is a progressive linkage equipped fully adjustable Sachs shock. As with all Panigales, the shock is mounted horizontally and mounted up and inside the left rider foot peg area. Braking is done with Brembo's excellent M432 calipers backed by Bosch's acclaimed 9MP ABS system that offers three modes and rear lift mitigation. In Race mode, ABS only works on the front 320mm discs allowing advanced race techniques to be employed. The ergonomics set-up for the 959, days Ducati, is a blend of racetrack commitment and street comfort - so not too extreme. Ducati makes special mention of the narrowness of the V-twin format which allows for greater feel, connection and sense of control. The Ducati 959 Panigale uses 10-spoke lightweight alloy wheels. 3.5" in the front and 5.5" at the rear. The tyres are 120/70 and 180/60 section Pirelli Diablo Rosso Corsa with three-compound construction. We have used this tyre on Indian roads on other motorcycles and we know it works well. Grip levels are excellent and life isn't too bad. Ridden carefully, the soft tyre offers excellent performance without undue punctures and issues. We have mentioned the ABS system but it is only the tip of the iceberg when it comes to the electronics inside the Ducati 959 Panigale. The motorcycle uses a large LCD display to show the data and that includes the electronic systems powering the riding mode you have selected. The display changes configuration depending on the riding mode. The riding modes you have are Wet, Sport and Race. Each selection sets a preset value for the Ducati Traction Control (DTC), ABS level, the Ducati Quickshifter (DQS) and Engine Brake Control (EBC). Ducati allows riders to go in and change presets in every mode for a completely rider-controlled, personal setup. To dig deeper, let us start with EBC. The EBC system offers a more predictable chassis attitude once the rider closed the gas, most critically, just prior to corner entry. This is done by spritzing a small amount of fuel that reduces the forces of braking generated by the engine's compression on a closed throttle. The EBC level determines how much or little the bike slows on its own when you close the gas. The utility of this is that you can predict chassis attitude better at turn in, allowing quicker steering inputs and more confident cornering. 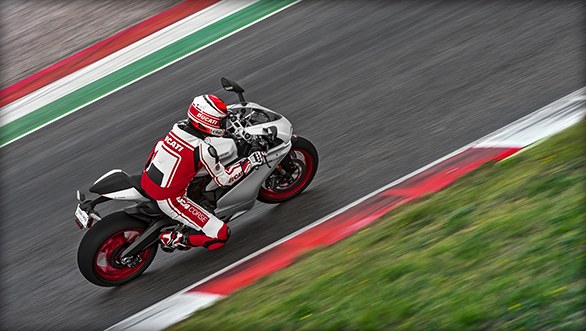 Ducati Traction Control is the latest generation of the system. It allows eight levels of intervention and you can turn it off. Each level allows progressively more wheels lip before the system intervenes. As is with all multi-level traction control systems, the higher number signals more aggressive electro-protection. So level 8 permits no wheel slip while level 1 presumes skill and allows liberal wheel slip. Each riding mode gets a preset DTC setting which the rider can customise to his liking. Like many Ducatis, the 959 Panigale is also DDA+ ready. This is the Ducati Data Acquisition system, an optional module that allows the rider to download telemetry data post ride. The + implies the latest generation of the system which can automatically detect the finish line and calculate lap times. An integrated GPS allows a circuit map and riding lines to be mapped. Also tracked are throttle opening, speed, rpm, gear engaged, engine temperature and DTC activation. 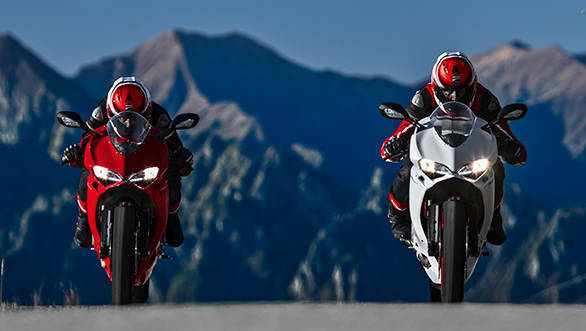 Ducati offers two preset accessory packs that enhance the function of the 959 Panigale. Ducati India confirms that the full accessory list is available in India. The Ducati Sport Pack focussed the 959 harder on sporty performance. The pack included carbon-fibre covers for the ignition switch and rear shock absorber, adhesive tack protectors, carbon sprocket cover and carbon heel guards. Also in there is an aluminium fuel cap, carbon-aluminium number plate holder and black handlebar weights. The Touring Pack goes about making the 959 more suited to long-distance riding. This includes the radiator protector, anti-theft, a comfort seat and a soft tank bag. 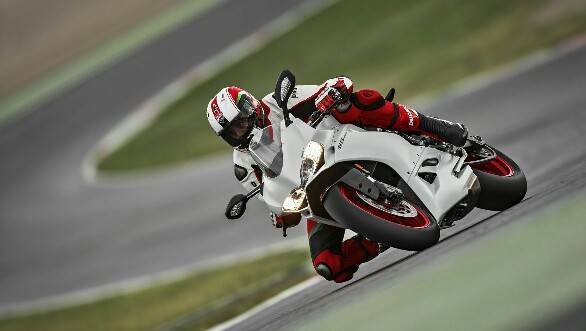 The Ducati 959 Panigale is a terrifically priced sportsbike despite Ducati's avowed premium positioning. 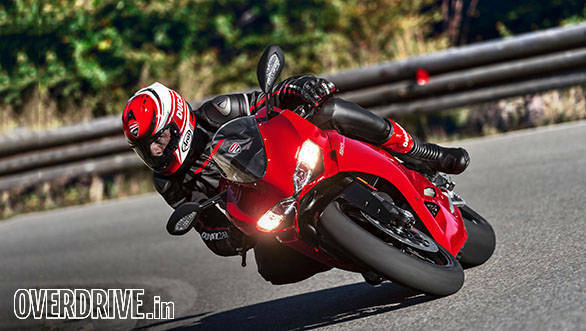 At Rs 14.3 (ex-Pune), the motorcycle offers a supermassive jump on, say, the 123PS Triumph Daytona 675R which is priced roughly Rs 2.1 lakh less than the Ducati 959 Panigale. The other peer is the brand-new MV Agusta F3 800 which offers just a smidgen less performance but is a more premium brand at about Rs 2.4 lakh more. 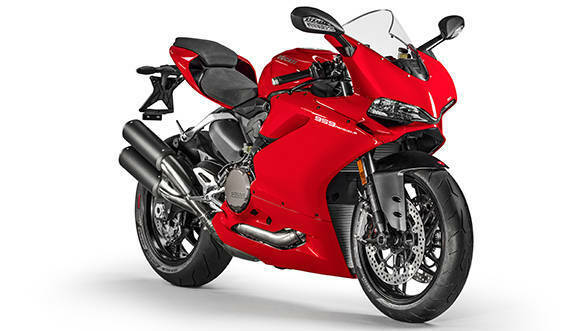 Ducati India has confirmed that India will get the Euro-4 spec 959 Panigale with the twin side-slung exhausts. Watch out for a test ride story soon on OVERDRIVE.